In ancient times, Chinese ancestors believed that the deceased could enjoy the same life pleasures in the underworld. Slaves and prized possessions were hence buried with the dead. Later, a new trend was in. Wooden or earthen figurines of human or animals, or "Yong," were buried with the master instead of living slaves. The practice lasted for thousands of years till the early Qing Dynasty (1644-1911 A.D.). Figurines made of various materials like pottery, silver, stone, porcelain, iron, and copper, have been unearthed across China, offering a glimpse of not only the underworld imagined, but more importantly, vivid life scenes of ancient Chinese. Slave and servant figurines were at the dead master's disposal. Warriors, officers, and honor guards were ready to receive orders from the dead emperor. Dancers and singers were pleasing an ever-silent audience. Dogs, monkeys, tigers, bulls, horses, bears, pigs, chickens, camels, and other animals made for a great fortune the dead could flaunt in Hades. Yet, more information is waiting to be decoded. What was the burial system of the time? How could the ancient Chinese create such superb artworks? To what extent have these figurines revealed to us the life style of our ancestors? 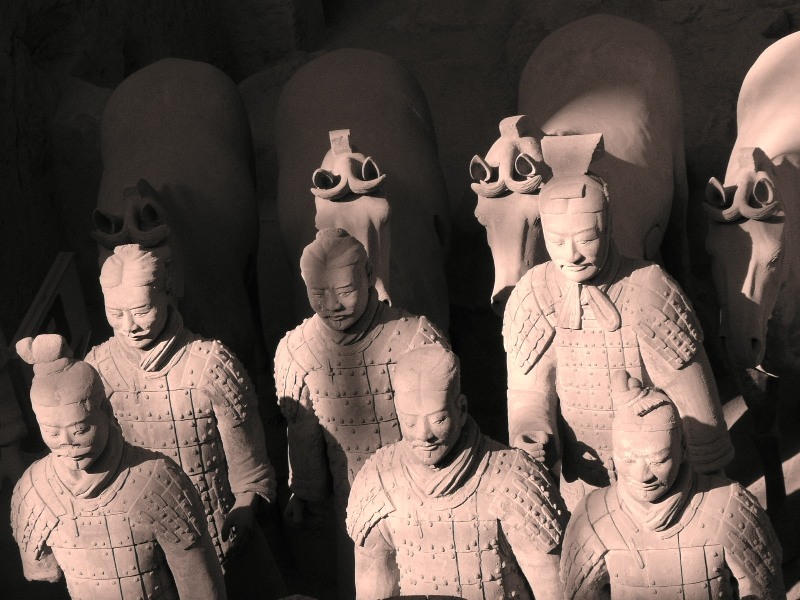 They are probably the best known burial figurines in the world - the Emperor Qin Shihuang's terrocotta warriors, or Qin Yong. Qin Shihuang, the first emperor of a unified China (259-210 B.C. ), had a city-sized mausoleum guarded by a life-sized terracotta army, at the expense of numerous lives. In his underworld, 6,000-plus terracotta warriors formed the same battle array as the emperor's colossal army who had swept all the other six states and took him to the ruler of a united China. The foremost three rows of vanguards and the last three rows of rear guards were armed with crossbows, making a classic military array.. The warriors are 1.8 meters high on average - the tallest of their kind in the world. The horses, 1.7 meters high and 2 meters long on average, are numbered in the hundreds. Each is unique in their looks and facial expressions, and has realistic hairstyles. Qin figurines were fine works of Chinese sculptural art made through many processes including molding, sculpting, carving, sticking, pressing and cutting. After that, they were baked in kilns and painted with colors. As proven by archeological discoveries, pottery figurines had been produced before and after the Qin Dynasty. But they were of smaller sizes. At the end of 1970s, figurines as big as the Qin figurines were reproduced in imitation. It took the labor of multiple workers over the course of several months to complete just one such figurine. Pottery horses of that size have not yet been reproduced so far. How these pottery figurines were made under such crude conditions 2,000 years ago remains a mystery.